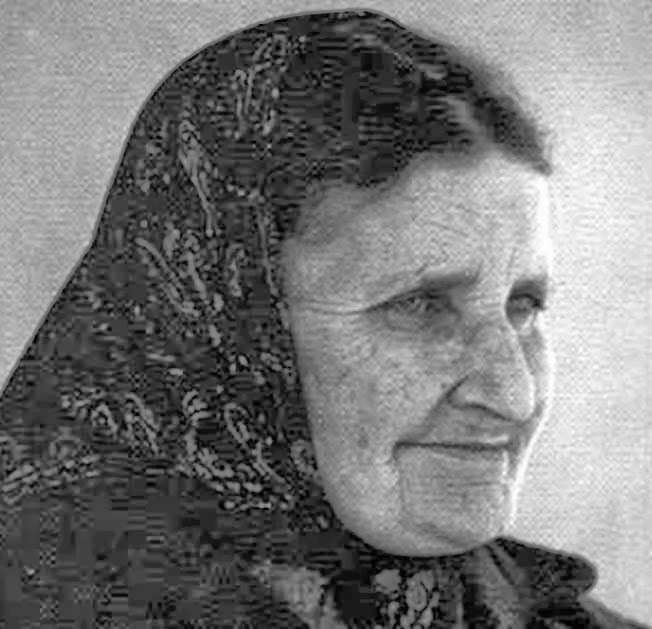 Sister Consolata Betrone was born in Saluzzo, Italy on April 6, 1903, and was named Pierina Lorenzina Giovanna Betrone. 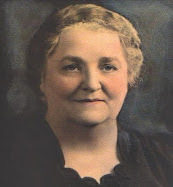 She was the daughter of Pietro Betrone and Giuseppina Nirino, who were the owners of a bakery in Saluzzo, who later became managers of a restaurant in Airasco (Turin). 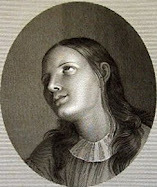 Pierina was the second of six daughters born of her father's second marriage. 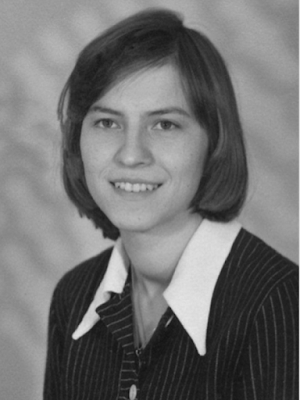 Nothing in the early life and background could foretell that this young girl would become one of Jesus’ beloved victim souls. 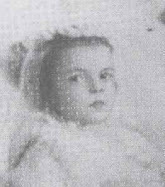 She seemed to live a normal childhood up until the age of 13 when one remarkable day our Lord cast His loving gaze upon her. It so happened that while she was hurrying to do her errands in the village when, unexpectedly, an intense prayer suddenly came forth from her heart: "My God, I love you!" and a unusual spiritual fervor overcame her. It was the beginning of her extraordinary experiences with the Lord. On December 8 1916, which was the Feast of the Immaculate Conception, Pierina dedicated herself to the Virgin. After receiving Holy Communion, she distinctly heard within her the words "Do you want to be Mine?" Deeply moved by this extraordinary grace, she wept with tears of emotion, and without understanding the extent of the question, she replied “Yes” to Jesus, entrusting herself to Him. As the weeks and months progressed, Pierina began to feel God calling her to the religious life. During the same time, and continuing for several years, she began a period of spiritual doubts, dryness and temptations, which were surely sent by the Lord to purify her soul. Our Lord first led her out into the spiritual desert in order to prepare her for her mission as victim soul. It was not until she was age 21 before she was finally able to realise the religious vocation that God was calling her to. "I do not call you for more than this: an act of continual love." 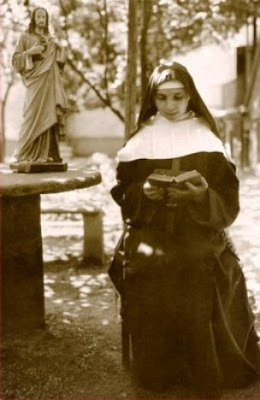 And for more than 16 years of enclosed Capuchin life this “act of continual love” would be the foundation on which she concentrated all her spiritual efforts. 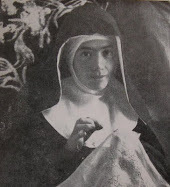 On April 8 1934, she took her perpetual vows, working in the convent as a humble cook, doorkeeper and cobbler. 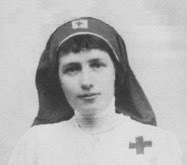 She was transferred on July 22 1939 to the new foundation of Moriondo, Moncalieri Turin, where she was also a nurse and secretary. Her exterior life was one lived out in daily sacrifices, penances and self denial, hidden to the world, in fulfilment of the tasks assigned her by her superiors. Although her exterior life was similar to her fellow religious sisters, in her interior life she was receiving exceptional and extraordinary graces from God, which unfolded unnoticed in the intimacy of her spirit. She became the confidante of Jesus and His Sacred Heart. "Do not think of me as a harsh God, because I am foremost the God of love!". Jesus, Mary, I love You! Save souls! It was then that our Lord also inspired Sister Consolata with this important universal prayer, "Jesus, Mary, I love you! 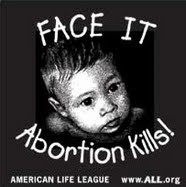 Save souls!" "I do not call you for more than this: act of continual love”, Sister Consolata began to thus repeat this one prayer, over and over again, during all her waking hours, in every form of work as she went about her daily duties. For it was Christ himself, who instructed her in the practice of what He called the “unceasing act of love” expressed in the words- "Jesus, Mary, I love you! Save souls!" "Tell me, what more beautiful prayer do you want to offer me? 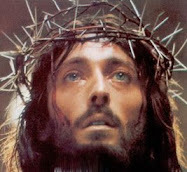 ---'Jesus, Mary, I love you! Save souls!' --- Love and souls! 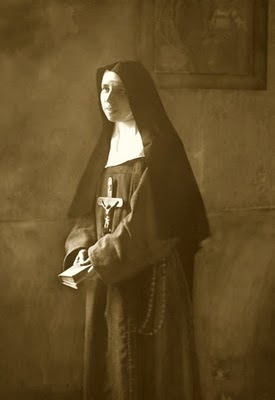 What more beautiful prayer could you desire?’"
"I have found that still weaker soul who has abandoned herself with complete faith to My infinite mercy: it is you, Consolata, and through you I will perform marvels which will far exceed your fondest desires." ‘See Consolata, the enemy will make every effort to shake your blind faith in me. But you must never forget that I am and love to be always kind and merciful. Understand my heart Consolata; understand my love, and never permit the enemy to gain entrance into your soul, even for an instant, with a thought of a lack of confidence in Me. Believe Me, I am solely and always kind; I am solely an always like a parent to you! So, imitate the children who at every little scratch of the finger, run at once to mother to have it bandaged. You should always do the same and remember that I will always cancel out and repair your imperfections and faults, just as a mother will always bandage the child's finger, whether it is really hurt or only seems so in his imagination. And if the child were to really hurt his arm, or his head, how tenderly and affectionately would he be cared for and bandaged by the mother! Well, I do this very same thing with regard to your soul when you fall, even though I may do so in silence. Do You understand Consolata? Therefore, never, never, never have even a shadow of doubt; a lack of confidence wounds My heart to the quick, and makes Me suffer. "I delight to work in a soul. You see, I love to do everything Myself; and from this soul I ask only that she love Me." "You see, even in good thoughts which creep in, there is always a bit of self-love, of complacency; and it is easy to see how they will spoil the act of love. But if you will complete trust in Me, that I am attending to everything and will continue to do so, and if you will not permit even one other thought to enter, then your act of love will possess a virginal purity." "You see, Consolata, sanctity means self-forgetfulness in everything, in thoughts, desires, words....Allow Me to do it all! I will do everything; but you should, at every moment, give Me what I ask for with much love!" "Consolata, place no limits on your confidence in Me, then I will place no limits on My graces for you!" "Trust always in Jesus! If you only knew how much pleasure that gives Me! Grant Me this solace to trust in Me even in the shadow of death." 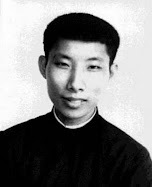 "If you are in Me and we are one then you will bring forth much fruit and will become strong, for you will disappear like a drop of water in the ocean; My silence will pass into you, and My humility, My purity, My charity, My gentleness, My patience, My thirst for suffering, and My zeal for souls whom I wish to save at all costs!" "You must think only of loving Me! I will think of everything else, even to the smallest details!" In the winter of 1944 her corpse-like color betrayed her. In obedience to her Suprior she subjected herself to a visit from the doctor. 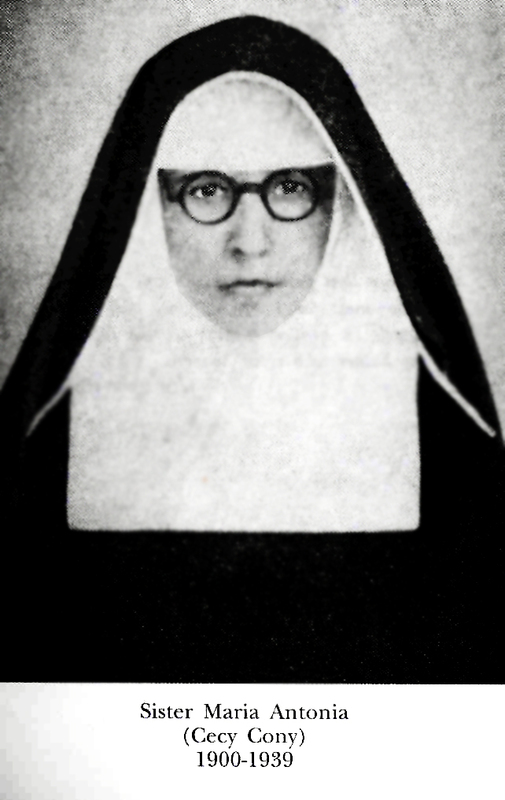 The doctor's reply was : "This sister is not ill, she is destroyed". On September 24 1945 Sister Consolata asked for half a day of rest and she laid down. The Mother Abbess took her temperature --39° C (102.2 F)! ‘How long has she been carrying on like this?’ it was asked. On October 25, 1945 and X-ray was taken revealing damage to her lungs; thus she was officially diagnosed with tuberculosis. On November 4, 1945 she left for the sanatorium. 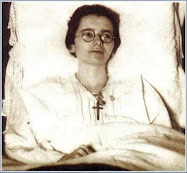 She remained there until July 3 1946, when an ambulance returned her, in the last stages of consumption, to the Convent of Moriondo. Now, "everything was finished", except to begin a new and eternal life forever united with God in Heaven. 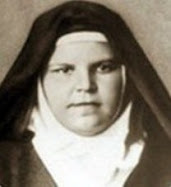 Sister Consolata died at dawn on July 18, 1946 in the Convent of the Sacred Heart of Moriondo Moncalieri Turin, Italy. ~Servant of God Sr. Consolata Betrone, pray for us! “The life of the Saints is a example of life for others"----It was with these words that on on February 8, 1995, Archbishop Cardinal Giovanni Saldarini in started the canonical process for five causes of beatification, one of these being the Capuchin Poor Clare nun, Sister Maria Consolata Betrone, in Turin Italy, in the Sanctuary of Our Lady Help of Christians. 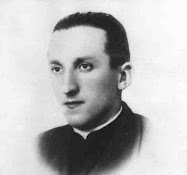 In fact, special merit lies with Father Lorenzo Sales (1889-1972), who was Sr. Consolata’s confessor and spiritual director from September 1935, for all his help with wisdom, discernment and guidance for the Work of God in the life of Sister Consolata. 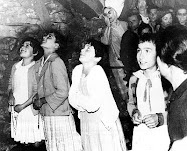 The official process of beatification/canonization of Sister Mary Consolata Betrone was opened in 1995, and on April 6, 2019 Pope Francis approved the heroic virtues of Sister Consolata Betrone, thus giving her the title "Venerable." Very well done, sir. I have been praying this very beautiful yet simple prayer, "Jesus, Mary, I love you--save souls!" 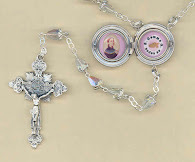 along with the Divine Mercy chaplet, more and more, especially at night when I awake. I think it is very efficacious. "He is only limited by our doubt." A very great mystery. Our family, Children and their children say this prayer Jesus Mary St. Joseph I Love You, save souls at mealtime. I just found this page tonight, however I think that God drew me here. I have been praying for the dying, for a long time...and now I have the prayer to do it with: "Jesus, Mary, I love you: save souls!" Such an amazing story, and an amazing Saint. Thank you for writing this! Sr. Consolata is now in my heart, and Bl. Anna Maria Taigi is more in my heart because of what you wrote as well. My brother is sick with alcoholism and her feast day (June 9) is his birthday, so she is his saint. I have been looking for help for him...and have also been praying to Blessed Matt Talbot. Right now it is life or death. My brother is on a drinking binge and it is very serious. Reading these biographies tonight has brought solace and given me courage. God Bless you! Don't forget the other important book by Fr Lorenzo Sales "The Littlest Way of Love". These two books (the other - "Jesus Appeals to the World") are essential reading, are in English and available from the nuns in Turin. Thanks for the information! I did not know about the book by Father Lorenzo Sales "The Littlest Way of Love". Please join our facebook group too: "SIster Consolata Betrone: Jesus Mary I love you! Save Souls!" We have direct contact with the nuns through Daniela on this Facebook group who is an oblate with the Monastery of the Sacred Heart and who is keeping us up-to-date with the devotion and news from the Monastery where Sr Consolata is buried. Thank you for your kind message and for the information about the Facebook group devoted to Sr. Consolata Betrone--I just requested to join this group. -Sr. Consolata Betrone, pray for us! "Jesus and Mary I love you! Save Souls!" Yes, you can post this on your blog if you would like. If you could please put that this website is the source for the article, that would be great. Dear Glen, your site is very beautiful! Thank you! Although I have difficulty understanding some mystics, I have a select group of "Heavenly companions" whose revelations bring me great comfort and light. One of these dear souls is Sr. Benigna Consolata Ferrero. You may have heard of her. I will post an article about her on my blog shortly. Feel free to use as much of what I post as you wish! I believe that her revelations will be of great profit to many individuals. I have typed the words up from her biography and book of prayers/revelations etc. I will post the link within a few days, hopefully! Please pray that I might not be so indifferent to God's will. God bless! 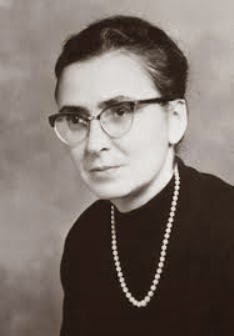 Thanks for your comments and for the information about the upcoming article on Sr. Benigna Consolata Ferrero. I am looking forward to reading it. What a beautiful and informative website! I am grateful for your servant's heart to bring this to the world! Sr Consolata Betrones work is very important to the Church . 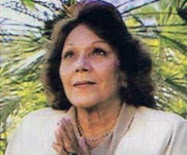 The Act of love prepares the Church for something greater to come and that is the Gift of the Divine Will by Luisa Picaretta another Mystic . The act of love becomes not only the salvation of one soul but becomes connected to all souls in all centuries . I had a dream a couple of nights ago in which I was told by a woman to help save 50 souls. I pray for souls those living and those gone. 'But 50? 'I thought. Then I "googled" prayers to help save 50 souls and I came across a rosary to save 50 souls. That is how I found this prayer which also led me to this page. So thankful that I found it! Simple, yet powerful. I have been praying constantly since I found it and have taught it to my children and parents as well. Thanks for this information!!! Turin also happens to be the site of the shrine of the Madonna Consolata di Torino, Our Lady of Consolation, and the seat of the Consolata order of missionaries and nuns. Thank you Glen. Your website is of great consolation, as is The Consoler, Consolata Betrone. Such a wonderful supplication"Jesus ,Mary,I love You. Save souls! I've taught my little granddaughter this wonderful short prayer. If less is more, this is it. I too have just told my little granddaughter how powerful and important this supplication is. These days when computers seem to "rule", this short prayer says it all. Jesus,Mary I love Thee. Save souls! Here it is, 2017 is ending and soon we'll be in the year 2018--I've noticed comments above going back to 2010-11. Keep it going, please! I echo someone above who said this brings solace and courage....i feel spiritually fortified now,in having learned this sweet little prayer. I've been saying this little prayer whenever I think of it, but had not read in depth about this beautiful servant of God. What a wonderful article, and website. I'm praying for my atheist husband to come to God, and will ask Sr Consolata to intercede for me. Dear Glenn - Just discovered your site as I was searching for references to Sister Consolata's prayer. Thank you! After reading your page on Gabrielle Bossis, I have ordered 3 copies of "He and I" and am looking forward to meditating on it this Lent, in preparation for my goddaughter Gabriella's First Holy Communion. Its nice to hear from you! Thanks for your comment. The book "He and I" is one of my all time favorites---you are going to love it, I'm sure. 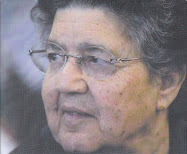 http://www.mysticsofthechurch.com/2010/02/servant-of-god-sr-consolata-betrone.html in case I am allowed to post it here. I am so happy to have bought the blue Pieta Prayer Book as most of what is in there is not only 'arcane' but accurate, real, and true, I believe. In there, one can find mention of this wonderful prayer. Our Lord made it clear to me a few weeks ago that my love wasn't pure enough. Jesus and Mary led me back to your site and the article you did on Sr. Consolata. I use to say this prayer, "Jesus, Mary, I love You! Save Souls!" - but I had gotten away from it the last few years. By means of this prayer Our Lord is giving me the grace of pure love. Thank you for creating this website. Thanks for your kind comments Dennis! May Jesus continue to draw you ever closer to Himself. My name is Consolata. How I wish to follow the prayers of st.Consolata. Jesus Mary and Joseph I love you save souls. Glenn, there is a newer book available on the Littlest Way of Love, by a newer religious Order, Children of Mary (perpetual adoration). I believe their Mother house is in Ohio. The book is, "I Will Think of Everything; You, think only of loving Me -- The Ceaseless Act of Love" . The book is in two parts; the second part is 'The Littlest Way of Love', the abridged message of Jesus to Ven. 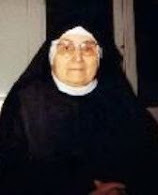 Sr. Consolata (Fr. 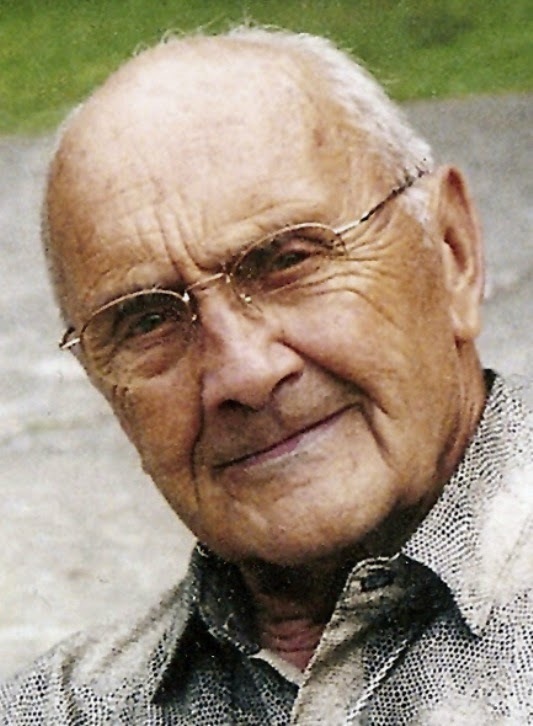 Lorenzo Sales, IMC). The first part of the book is written by one of the Sisters of the Children of Mary, and is exquisite. I appreciated this site and lots of biographies of mystics and victim souls to read about. 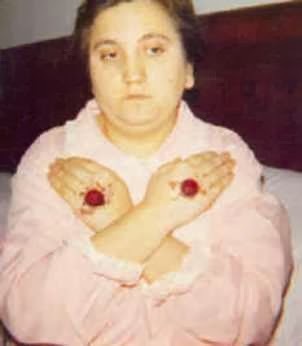 I landed on this site many years ago when I searched about St. Gemma Galgani. It was a lot of info and helped me a lot. 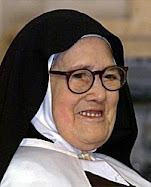 I have just read from the Vatican News that the Holy Father has approved the heroic virtues of Sister Consolata Betrone last April 6th, thus giving her the title "Venerable." Thanks and May God bless you abundantly. Thanks for the information Carlos! I just edited the article to reflect her new title. I sincerely appreciate the update. 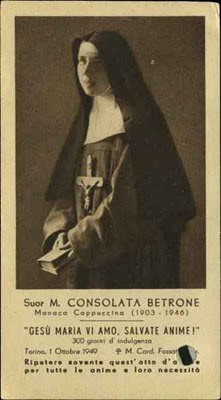 Venerable Consolata Betrone, pray for us!